For all the free-spirited, bohemian, vintage lovers out there, this MM Vintage Charlotte Skinny jeans review is just for you! As a vintage lover and collector, nothing makes me happier than stepping into a small little store full of old dusty treasures! Its the thrill of the hunt, and the feeling of not knowing what you’re going to discover that excites me. I am obsessed with finding old and destroyed denim, especially when it has unique, quirky, and special design elements. So when it comes to re-creating and re-designing vintage denim, no one in my books does it quite like MM Vintage. 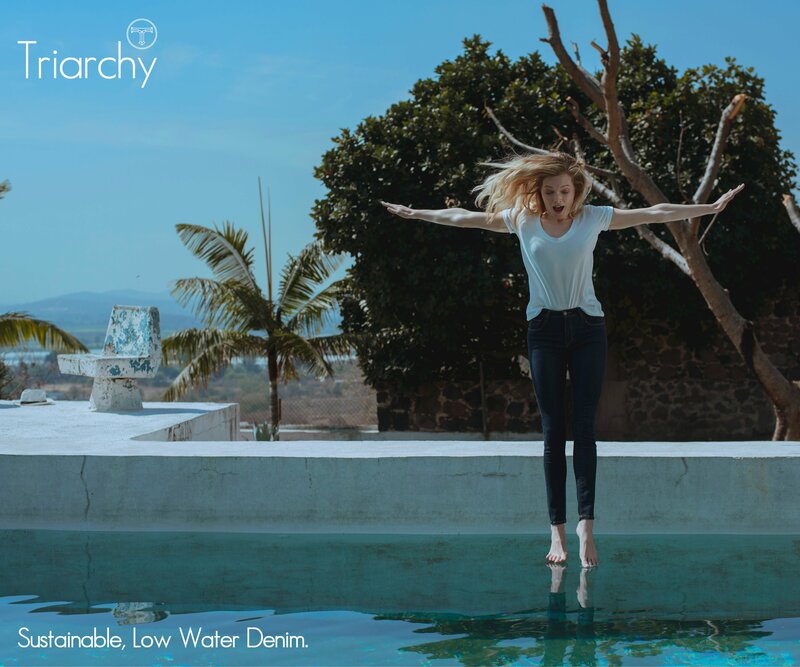 They are an excellent example of a brand that is incorporating all those vintage elements we love and obsess about with the workmanship, spirit and feel of traditional high-end denim. What really seems to set them apart in the midst of all this denim madness, is their unique embroideries, accent stitching, and intricate details. They definitely have that California vibe down and you’d most certainly catch a flower, wreath-wearing Vanessa Hudgens in a pair of these during festival week, and probably on any other given day picking up a “fro-yo” down in Silverlake. These embroidered beauties are for those of you who appreciate craftsmanship, and aren’t afraid of a little of that bohemian artisan flair. So please keep reading because I’d love to tell you more about the Charlotte Skinny Jeans and why I’m so enchanted by them. 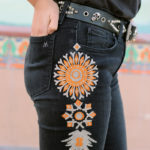 First-off, let me start with the obvious, MM Vintage’s Charlotte skinny features a beautifully embroidered, two-tone, “starburst” like motif on both sides of the hips. Yes, Its a very bold, generously sized, Tribal-esque design that is placed strategically on those baby making hips…and though I wasn’t crazy about the obvious placement in the beginning, I was more than eager to try them out; Because…why wouldn’t I want to see my lady lumps accentuated!? Once I had these on I was able to really appreciate the detail and the emphasis on “said” hips. I felt the placement of the embroidery definitely gave my legs a longer leaner look, something unexpected, but greatly appreciated! The faded black denim wash looked amazing with every single vintage tee I paired it with, which is a huge plus in my books! (Im sure you’d have some pretty badass tees to pair this with) This is definitely not your typical black denim wash, it is a beautifully faded black wash with perfectly placed, subtle whiskers. I guess you could say its the ideal black “vintage” wash. The fabric itself has a great “hand” that was heavy enough to keep everything it its place (I’m sure we all appreciate some structure) and there was plenty of stretch with lots of comfort and mobility that sat perfectly on my hips without cutting into them or creating that infamous “muffin top”. Though the inseam could have been a bit shorter for me, it wasn’t the biggest deal since its always a reoccurring issue for my height, and that is something that can always be adjusted to your preference later. Lastly if I could make a checklist for everything this jean has to offer, I’d probably run out of boxes to check. This jeans is a piece of art, and its a star in its own right. You could pair it with a simple washed down tee and let the jean speak for itself or go wild and let that rock and roll hippie style shine with combat boots, printed vintage tee and moto jacket (my automatic go-to’s)! One things for sure, Shakira was right ya’ll, “these hips don’t lie” especially with a pair of these on ya. 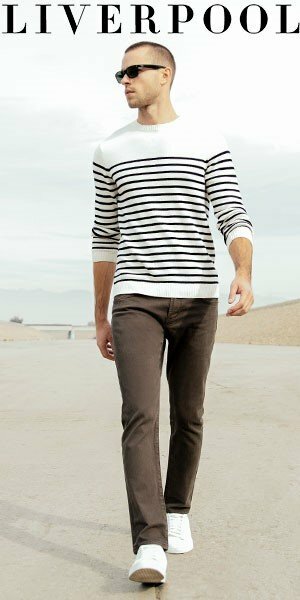 Ive been long due for a good pair of black jeans, and though definitely not your typical, black jeans; these jeans are special enough to wear anytime and anywhere! There’s allot of character and personality and special attention to detail in these jeans. Those vintage traits and characteristics are executed flawlessly by this brand. Their approach is very effortless and organic, its very tribal and my rock roll stud loving booty loves these one of kind jeans. Hey there! 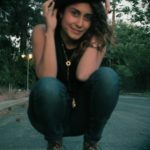 I'm Roxana, a fashion designing, yogi, B-girl from Los Angeles. I've been working in the fashion industry since the age of 15 ;) interning for every possible company I could get into. I've designed everything from juniors, to athleticwear, childrenswear and even dabbled a bit in the denim industry. I'm here for the love of denim and so are you...SO, I know you and I are gonna get along just dandy! Really like the boots you wore with the jeans. They completed the look well. The Charlotte seems to suit your personality. Thanks MJ, I instantly connected with these the moment I saw them…did you see their other stuff?!? they have these really cool studded pants and these cool moto jeans….I’d stud everyting if I could. Thanks for reading the review and for your comment! Looks like a pair of jeans to wear to a concert where the music is in tune with the denim’s vibe. You did a thorough review. Hi BHTPC! happy 2017! I agree with you! thanks for your comment!! LOVE LOVE LOVE the beautiful tops shown on the web site banners, but I couldn’t find them on the site for sale. I love the embroidery on these jeans and the Rosie jeans. I don’t love the sat on a chalkboard effect seats, The picture above looks like the horizontal rolls especially under the seat may be caused by denim that doesn’t stretch up and down but stretches a lot in other directions. Hi Kitty! Yes the tops are amazing…I’m sure you clicked on tops https://mm-vintage.com/collections/tops , but I noticed some weren’t for sale either, might be new collection coming soon!?! Thank you for your comment and input! I noticed that too…but still pretty comfortable and flexible. I’m very impressed with the vision & the embroidery. I will check back for the 2 gorgeous distinctive tops on the banners and the jacket on the lookbook banner. LOVE, LOVE, LOVE.